"How did I get into this?!" 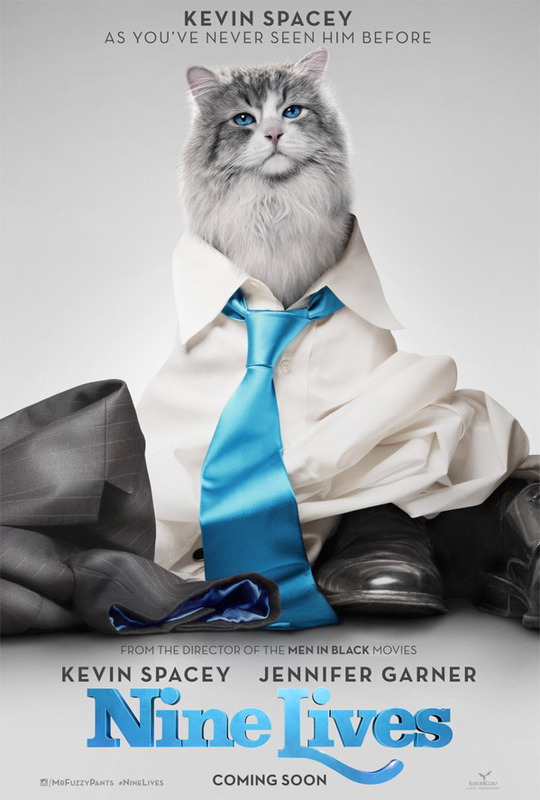 EuropaCorp has unveiled a teaser trailer for a comedy called Nine Lives, which is a funky body switch film where Kevin Spacey ends up inside of a cat named Mr. Fuzzypants. The whole point is that Kevin Spacey plays a businessman who doesn't care enough about his family, and when they end up getting a cat (from pet shop owner Christopher Walken) he is put inside the cat in order to learn a lesson about spending time with them. The cast includes Robbie Amell, Jennifer Garner, Teddy Sears and Cheryl Hines. This is just a teaser trailer (IMDb even claims they're not done filming yet) and barely has any footage, but cat lovers (and fans of Kevin Spacey or Christopher Walken) will definitely flip for this. As someone who watched those Look Who's Talking movies way too much as a kid, I can't say this isn't something I'd watch. I wouldn't pay for a theater ticket, but definitely would watch. That's exactly what I was thinking. It's the Shaggy Dog but...with a cat. Not for me. I'm sure there is an audience out there since this is probably a 2 hour compilation of LOLCAT skits. People seem to like that stuff. Because the role was purrrrrfect for him? Or more likely the money was up there in the meowllions! Lol, your avatar is perfect for this comment. I feel like his role in this is almost identical to his role in Click with Adam Sandler. Wow...I don't even know what to say about this movie, looks...terrible. The only answer that makes sense...money. Let me guess; he learns to be a better father and human being through being a cat?